With more than a dozen national touring artists appearing at the Dakota Jazz Club this month, along with the Return to Forever reunion tour and the annual Twin Cities Jazz Festival, we risk an overdose of musical genius. But it is a risk I am willing to take. Tuesday night was the first Twin Cities visit of Steve Turre’s Sanctified Shells, although Turre the trombonist was here last summer as part of the Dakota’s Trombone Summit. I caught his sextet at Dizzy’s in New York last fall. 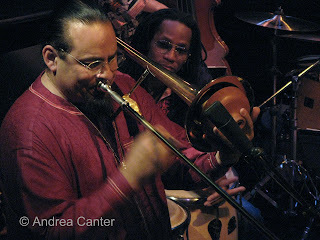 As a trombone master, Turre launched his career with the Escovedo brothers, then worked through a pantheon of legends, from Ray Charles and Art Blakey to Dizzy Gillespie, McCoy Tyner, J.J. Johnson, Herbie Hancock, Lester Bowie, Tito Puente, Mongo Santamaria, Van Morrison, Pharoah Sanders, Horace Silver, Max Roach, Woody Shaw and Rahsaan Roland Kirk. Kirk introduced Turre to the seashell as a musical instrument; while touring with Shaw in Mexico, he learned that his own relatives had played the shells. Shells, Turre told the Dakota audience, are the roots of the horns. Indeed it seems that the first wind instruments were seashells which indigenous peoples used to communicate as well as entertain. In the Mediterranean, a shell sounded as a fog horn; in Samoa, a blast of the shell announced the comings and goings of boats; Shinto priests still use a triton trumpet to summon their constituents to prayer. Turre has spent years refining the use of shells in music, specifically salsa-drenched jazz. Imagine the Dakota club stage with twelve musicians—a standard rhythm section, congas, “talking drums,” and seven hornmen (one trumpet/flugelhorn player, a tenor sax, and five trombones). Add to the musicians an arsenal of mutes as well as a variety of shells. The dozen become a full symphony. Remember as a kid filling empty pop bottles with water, and blowing across the open top to create a strangely resonant sound? Watching Steve Turre and his “shell section” at work evokes a similar image, especially as Turre moves from one shell to another, a small one for high pitches, larger ones for lower pitches. On most tunes, only Turre blows the shell, usually alternating with the trombone. The shells have a unique vibrato, perhaps most like a flute in tonal quality. 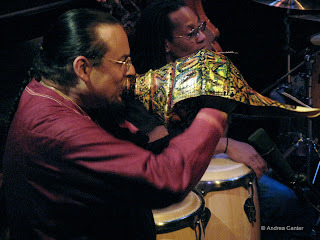 Sometimes Turre blows through two shells at once to create his own harmony. On his opening tune (“The Emperor), Steve promises to take us on a journey in which each musician serves as a storyteller, and the musical journey evolves through a sequence of instruments. The most versatile of all is Turre who grabs one hand percussion tool after another, then shells, maracas, block and cowbell, and of course trombone. An unexpected treat is hearing the great Billy Harper on tenor sax, his twisty turns of phrases reminding me of my recent encounter with Charles Lloyd. No shells needed to create a unique, orchestral sonic poem out of “Body and Soul,” the trombone giving it more body, Harper’s sax giving it plenty of soul. “Rhythm Within” is more shell-oriented, with three of the ensemble putting down trombones for shells, including bass trombonist Aaron Johnson hefting the biggest white conch I ever saw, creating notes that suggest a tuba. “Happiness” is partly composed, partly created on the spur of the moment and features Turre on a large painted shell while three trombonists put down the brass in favor of the varying sized shells. The ensuing conversation is filled with joy, salsa with hard boppin’ overdrive. As on the other tunes, the rhythm section pushes the band with abandon, pianist Benito Gonzales (who was here last summer with Kenny Garrett) shining throughout with his raw energy and devastating rhythm. If Steve Turre only played trombone and composed music, he still would be known as one of the modern-day giants of jazz. His leadership in developing shells as viable instruments is nothing short of genius.